Have you ever said the wrong thing to someone, (as in “open mouth, insert foot”), instantly realized the brilliant thing you should have said, and thought, if only I could go back a few minutes in time … The owners of the time travel devices reviewed in the books in today’s post have that power. But it turns out to be a little more complicated than you might imagine. In many time travel books characters journey to interesting faraway places. For a change of pace, in my last post I reviewed a couple of books in which the characters went back in time without ever leaving their house. In The Magic Half Miri goes back 73 years, and in Voices After Midnight Chad goes back 100 years. The time travel books reviewed in today’s post are the first I’ve found in which the characters not only stay in their neighborhood/town, they also remain in the week they are currently experiencing. The Power of Un, Nancy Etchemendy, (2000, 148 pages) is funny but parts of the plot have a serious tone. When the book starts, middle schooler Gib has just had a Friday where everything went wrong. The clincher is, he was supposed to go to a carnival that night with his best friend Ash, but now he has to bring his little sister Roxy with them, which means he and his buddy won’t be able to ride any of the scary rides. It’s not fair. What if you had a machine that gave you the power to undo any mistake? Not just in a game, but anytime, anywhere, any mistake at all? The device has an H button, M button, and a S button. Gib and his best friend Ash figure out this allows them to customize how many hours, minutes and even seconds they can go back in time. Only the person who pushes the buttons is aware of the time repeating. At the fair, Gib decides to just once ride the Devil’s Elevator with Ash. In those three minutes Roxy gets into big trouble. The old man had told him to only use the unner only when he needed to. Roxy getting hurt seems like a clear-cut case. However, a time re-do turns out to not be simple. Using it sets other strings of events in motion. How will Gib change only the things that he is meant to change, and not other stuff? This was a book that managed to be funny and suspenseful. The characters were believable. The Power of Un has a much more thought-provoking premise than the average time travel book. You could have a good discussion about what mistakes from your own life you would undo, if you had the power. I appreciated the fact that in The Power of Un and the below-reviewed 15 Minutes the boys avoid the obvious: using their newly found magic to win a lottery. In both books they decide it can be more important to help others rather than themselves. 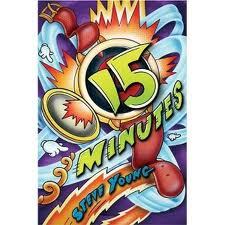 In 15 minutes, Steve Young,(2006, 172 pages), Casey finds an old watch in the attic that his grandfather made. Casey can’t choose how far back in time to go; the watch always takes him back 15 minutes. Still, the possibilities he finds for improving his seventh-grade life with the Go-back are endless. He realizes he can eat a plateful or food, then start over without being full. After blowing a conversation the first time with the prettiest girls at school, he finds the perfect comments to impress them. As in The Power of Un, only the person pushing the button on the device is aware of time repeating. Casey is on the football team, although most of the time he just serves as the water boy. He doesn’t get to play often because he is terrible at the sport. A few days after finding the Go-back however, Coach does put him in a practice game. At first, Casey trips over his own feet and bellyflops, in his usual style. But he realizes he is wearing the Go-back. He saw where the football was just thrown. Casey pushes the magic button,and goes back in time fifteen minutes. This time he is in just the right place at the right time to intercept the ball. Everyone is amazed at his transformation to star football player. This is your chapter. Get a separate piece of paper and write down as many things as you can about what you would do if you had a Go-back. I’ll wait. One chapter I loved is written from the point of view of the school bully who briefly steals the watch. This book is a fun read, quick enough to read in one sitting. Whoa–I think I just gained a little insight into what short-term time travel feels like! In the middle of writing the above paragraph, I hit a random computer key and three-fourths of my post disappeared. I’ll admit I cried a little. I’ll admit I said some words that I will not print here. I needed the words back because I am lazy and did not want to rewrite the post. I hit a bunch of other keys–nothing worked. Then, I found the time-stamped “revisions” section of my WordPress worksheet. And there were all my earlier drafts of the post which I had saved. I clicked “restore” on the version from ten minutes prior. Voila! It was back. It wasn’t a short-term time machine, but it was exciting, all the same. Question: Would you go back in time and undo a mistake you made if you could? This entry was posted in Book reviews and tagged 15 Minutes, Book reviews, Books, middle grade fiction, Nancy Etchemendy, Power of Un, Steve Young, time travel books, time travel novels. Bookmark the permalink. Time travel seems to be a real theme this week. I featured Margaret Peterson Haddix’ “Sabotaged” (The Missing, book 3). Fun reviews. I love MG! I’ve never read either of these–thanks for expanding my time travel tbr list!